Paul Cézanne was born in the southern French town of Aix-en-Provence on January 19, 1839. A leading figure in the impressionist and post-impressionist movements, Cezanne had a profound influence on the course of modern art. However, during his life Cezanne exibited little and it was not until the turn of the 20th century that the significance of his work began to be recognized. 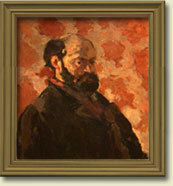 At the age of 23, after a number of bitter family disputes and with the encouragement of his childhood friend Émile Zola, Cezanne went to Paris to study. By the mid-1860s Cézanne had established himself as a painter, though with minimal official success: he was denied entry into the École des Beaux-Arts and systematically excluded from the Salon exhibitions. This first phase of Cézanne's career, heavy with dour portraits and emotionally charged scenes reflected the artist’s initial debt to Gustauve Courbet, whose work he encountered in Paris, as well as a typically Provençal appreciation for vigorous paint handling. This rough style paralleled anxiety in his personal life and a discomfort in the French capital which led him to shuttle back and forth between Aix and Paris seeking a more definitive artistic voice. During his stays in Paris, Cézanne studied art and forged alliances with prominent artists, such as Edouard Manet, Claude Monet and most notably the impressionist Camille Pissarro who would prove to be the most significant influence on his artistic development. Pissarro counseled Cezanne to shift away from the dark and heavy tones and thick textures of his early work to brighter hues, a concern with perspective, and an interest in scenes of farmland and rural villages. Together, they painted en plein air in the southern French countryside; his time working in the “good sun” of the south with his mentor greatly influenced the future course of Cezanne’s work. Provence was Cezanne’s country: he was at home there as nowhere else. His sense of being grounded in so particular and so familiar a place, resonant with memory and emotion, caused him to concentrate much of his extraordinary pictoral intelligence there and to create from that landscape some of the most remarkable and original images in late nineteenth- and early twentieth-century art. Nature was Cezanne’s inspiration throughout his career, and he sought to be a worthy interpreter of the beauty he saw in the Provençal landscape. It was his goal to convey his visual sensations of color, light, and space in the medium of paint, and he succeeded magnificently, producing works of compelling tactile quality and coloristic beauty. In the distinctive country side around his native Aix-en-Provence, Cezanne found the images rich in natural beauty and in emotion that have since become synonymous with his art. Cezanne created some of his most compelling images in the solitude of Provence, including not only landscapes painted outdoors but also portraits and still lifes. Throughout his career, Provence remained a constant source of strength in his struggle to master the means of artistic expression. Other artists had come to paint the Provençal landscape before him but Cezanne made his corner of Provence uniquely his own, adopting motifs and view that convey a powerful sense of place. In his mature work, Cézanne sought to realize a “harmony parallel to nature” by expressing the essence of the visible world through the use of color and reduction into basic, underlying shapes. His portraits are intense, penetrating studies of character. Cézanne moved away from the traditional focalized system of perspective, and portrayed objects from shifting viewpoints. His “Bathers” (1898–1905) is the monumental embodiment of Cézanne’s visual systems and originality. Cézanne died on October 23, 1906, at his home, 23 rue Boulegon in Aix. He left a large volume of letters describing his efforts, which are housed at the National Gallery of Art. A look at the exhibition at the National Gallery of Art and a small sampling of works by Paul Cézanne. The Eugene B. Casey Foundation Cezanne in Provence is a production of WETA Washington, D.C.